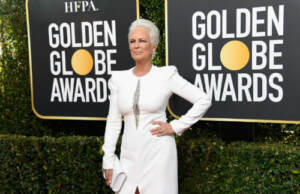 The 2019 Golden Globe Awards are behind us, but we still can’t stop thinking about some of the stunning hairstyles we saw on the red carpet. 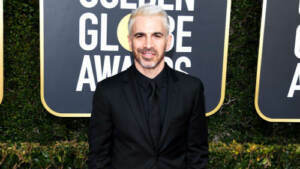 Whether it was Lady Gaga’s bold statement matching her hair color to her dress, Chris Messina going with a platinum blonde look or Jamie Lee Curtis going all natural, there were plenty of great hairstyles on display. Here’s a look at some of the top hairstyles we saw, and some of them you may even be able to achieve on your own with the right quality hair care routine. RemySoft enjoys seeing all of the creative hairstyles on display any time celebrities walk the red carpet. However, we truly believe the average person can accomplish similar styles with the right quality hair care routine and advice from a great stylist. If you saw a hairstyle at the Golden Globes you like and want to try to copy, contact us to learn about some of the secret tips to help you achieve it. Dry skin and static hair are the two things almost everyone has to look forward to when the winter months arrive. However, both of them are usually preventable with the right techniques and products. Talking specifically about your hair, oftentimes all it takes is switching up or adding different hair products for Remy hair to your hair care routine to add in some moisture. Here are some great tips you can try to incorporate to have smooth and static-free hair this winter. A good hydrating shampoo itself may not completely eliminate static in your hair, but it can definitely ensure it’s not as bad as it could be. Dry hair equals frizzy hair, which will only make the static worse. Shampoo full of sulfates can strip the natural oils from your hair as well, which can dry out the strands. So the main thing you need to look at to prevent static as much as possible is ensuring you are using a sulfate free shampoo with a hydrating formula. 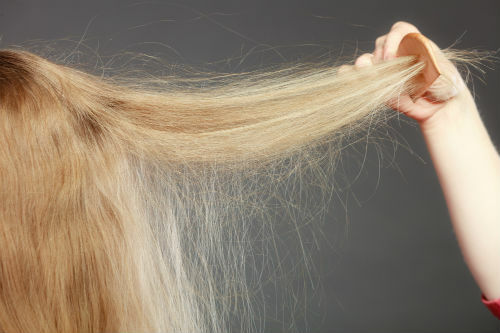 Drying your hair too much or with the heat too high could create dry hair strands. Air drying whenever possible is ideal, but you can still reduce static by turning down the temperature to a lower setting if you have a hair dryer with temperature control. Other hair products for Remy hair, like a heat protectant, can also go a long way in protecting your hair from becoming too dry. You’ll know right away if your hair is too dry since it will appear frizzy afterward. Sometimes the best way to ensure your hair doesn’t get frizzy throughout the day is to spritz a little bit of hairspray before you head out for the day. Of course, there are plenty other hair products for Remy hair you could use to accomplish the same thing, so there’s never any harm in experimenting to find what works best for you. No matter if you have straight hair, wavy hair or curly hair, a quality hair spray could be your lifesaver when it comes to your hairstyle. At RemySoft, we know exactly what you’re going through when it comes to your static hair during the winter. We hope these tips work to help you calm your static hair a bit and make your hairstyles easier to accomplish. The winter months always present different challenges with your hair, so trying different products and techniques will usually end up with you finding the best solution. We have a wide range of hair products for Remy hair for you to experiment with, so never hesitate to contact us and learn more about how they can help you. Throwing together a quick hairstyle in the morning when you’re in a rush is possible, but it typically doesn’t end up how you want it to. When you know the next morning is going to be frantic, or you simply won’t have time to style your hair how you’d like, consider an overnight hairstyle hack or two. All you need for most of them are some hair products for Remy hair, and of course, your sulfate free shampoo. Here are some tips and tricks for achieving hairstyles you can literally create while you sleep. If a voluminous hairstyle is what you want in the morning, then tossing and turning while you sleep with your hair down isn’t going to help. Instead, wash your hair with your sulfate free shampoo like you normally would, and maybe even add in some leave in conditioner as well. Then tie your hair up into a high bun and secure it. You won’t have to worry about it getting tangled or flattened while you sleep, and when you let the bun down in the morning, you’ll just need to shake it out and admire the volume that remained overnight. Whether you have naturally curly hair or just want to make your curls the night before to save time in the morning, a silk hair scarf can be a lifesaver. Once your hair is curled, gather it up in a ball at the top of your head and wrap the silk scarf around it. The silk material helps protect the volume of the curls more than simply wrapping the hair up in a tight bun. The idea is to remove the silk scarf in the morning and you should only have to run your fingers through your hair to see the same quality curls you had the night before. There’s been a big craze about heatless wavy hair lately, and for good reasons. To create this hairstyle, start with using your sulfate free shampoo and leave in conditioner. Once you’ve dried your hair completely, braid your hair in one big braid if your goal is to have loose waves. If you prefer tight waves, then have various small braids. Release it in the morning and you’ll have wavy hair that looks like it took you hours in the morning to achieve. RemySoft wants you to be able to style your hair how you want to, and with as little effort as possible. Some hairstyles do take a while to achieve, but your day-to-day hairstyles don’t have to fall into that category. So the next time you can’t decide how you want to style your hair the next morning, consider these overnight styles to save you some time. And never hesitate to contact us if you have any questions about them or about your hair specifically. If you have naturally curly hair, you probably don’t need us to tell you how challenging it can be to straighten it. But the good news is there are different techniques to make the process a little easier and more successful. In fact, sometimes it simply comes down to reducing the amount of hair products for Remy hair you use to make the hair easier to work with. 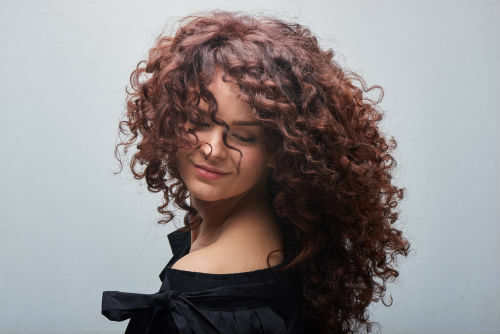 Here are some of the most common mistakes people with curly hair make when trying to straighten it. When you overuse quality hair care products, you can reduce the impact the straightening iron has on the hair. Plus, when you do finally get the hair straight, chances are it will have a greasier appearance than you’d like. Limiting your hair products and washing with a sulfate free shampoo beforehand will strengthen the hair and put it in the best condition possible for straightening. Temperature control in a hair straightener is a lot more important than people give it credit for. So if your hair straightener doesn’t allow you to adjust the temperature, and you aren’t seeing the results you want, it may be time for an upgrade. The standard temperature setting on your straightener could be too hot or too cold, depending on your hair type, so experiment with different settings until you see the best results. Next to washing your hair with sulfate free shampoo, the proper blow-drying techniques are most important when straightening curly hair. Your first step should be to pull your hair up when blow-drying it to give the roots some added volume. Then once the roots are completely dry, you can blow-dry the remainder of your hair downward to create the straightening effect. 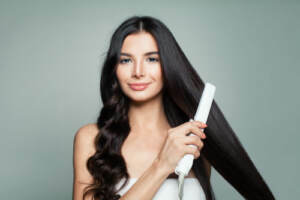 Many people overlook the importance of the upward blow-drying motion to begin with, so give it a try the next time you attempt to straighten your hair. 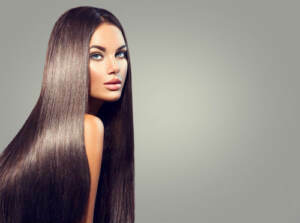 Sometimes you don’t have the time or patience to dedicate to your quality hair care routine, which can lead to straightening sections of hair that are too large. Separating the hair into smaller sections is typically more effective since each strand gets the proper amount of heat. Straightening large sections may cut down on styling time, but the results won’t be as good. At RemySoft, we understand the challenges people go through with different hair types. People with naturally curly hair are envied by many people, but we also know those curly-haired people sometimes don’t want their curls. The best thing about hair styling is there is an available solution for everything. Many times you have to experiment on your own, but feel free to contact us at any time for some tips to help you get on the right track. People who deal with frizzy hair all the time can sometimes feel like they are fighting a losing battle. And in some situations, you may be. Your hair isn’t going to cooperate with you some days, and that’s when you just need to embrace your hair for what it is and make the most of it. The good news is you don’t have to go out looking like a mess with your frizzy hair. You can transform it to a hairstyle that will impress. With the right quality hair care routine and the right products, these four hairstyles can help you embrace your frizzy hair and look fabulous at the same time. If the idea of your hairstyle is to be a messy bun or ponytail, then frizziness is just part of it. Freshen up your hair a bit by washing it with a sulfate free shampoo and conditioner, then pull it up in a bun or tie it up in a ponytail and let it do what it wants. With this hairstyle, the messier the better. You may have to tease your hair or add some of your favorite products to it, but for the most part these hairstyles are pretty effortless. Everyone has their own idea and opinion on what braids should look like. Some people want them to be tight with every hair in place, some people want them loose and other people may want them voluminous. When you have frizzy hair, having naturally textured braids are simple, since all you have to do is braid your hair. Adding in hair extensions can create even more volume, so feel free to get as creative as your heart desires. If your goal is to create a big, bouncy and voluminous hairstyle, then experiment with curling your hair. Frizzy hair is perfect for curls, since it will naturally make the curls look bigger and looser. 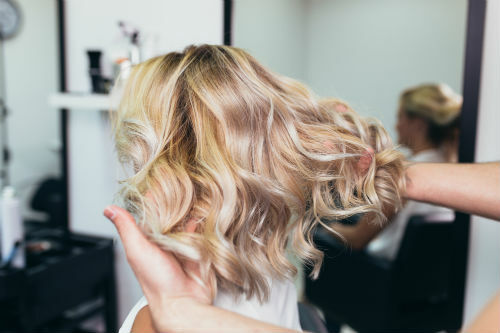 It’s easy for people with straight and frizzy hair to accomplish curls by using a basic curling iron and allowing the frizziness to do the rest. A popular hairstyle for people with frizzy hair involves braiding the hair while it’s damp and then letting it loose once it dries completely. The result is a beautiful head of wavy hair that has even more volume because of the frizz. Using your sulfate free shampoo and conditioner is important to strengthen and protect the hair when you tie it into tight braids. Your waves can be as loose or as tight as you desire by running your fingers through them and using the right products to hold them in place. RemySoft believes there are several perfect hairstyles for everyone, no matter what your hair type is. We understand frizzy hair limits your ability to create certain hairstyles, but there are also plenty of hairstyle options at your disposal. With the right quality hair care products, you’ll be able to embrace your frizz and be pleased with your hairstyle outcome. Always feel free to contact us for product recommendations or tips and tricks on how to create the hairstyles you desire. You hear many people say they are just trying to get through the winter and will take care of any quality hair care needs when the weather starts warming up again. But just because the weather is cold and dreary outside doesn’t mean your hair has to reflect a similar appearance. There are plenty of winter hairstyles that are easy to create and look fantastic. Here are four different hairstyles we are particularly interested in and you should consider trying out this winter. There’s a difference between voluminous curls and beachy waves, although the technique for creating them is similar. What you’ll need to achieve this hairstyle is a great sulfate free shampoo and conditioner, a quality hair dryer and some hair extensions if you need some added length or volume. Simply curl your hair as tightly as you’d like, let them loose and run your fingers through the curls and you’ll have a bouncy hairstyle that is perfect for any occasion. Spice up your traditional ponytail this winter with a little texture. Again, if you need hair extensions for length or volume, then feel free to incorporate them for this hairstyle as well. The goal with this hairstyle is to create flat and sleek hair on the top of your head and then texturize the ponytail how you want to, whether it’s curls, waves or anything else. There’s nothing wrong with tying up your hair with an attractive accessory. And the great thing about tying up your hair is you have so many different options to consider. You could tie up your bangs or let them hang down. You can make the hair on the top of the head flat and sleek or pull some out of the tie to give it a messy appearance. No matter which option you choose, you can spruce it up even more by incorporating a ribbon or bow of your choice. The flipped out hairstyle may seem old school, but it’s beginning to trend again for good reasons. You can flip it out by parting it down the middle or doing a deep part from one side to the other. Be sure to wash your hair with a good sulfate free shampoo and conditioner so it will be easier to work with and look nice and shiny. This hairstyle is perfect for people who have medium-length hair that goes down to around the shoulders. RemySoft has all of the latest tips, tricks and trends when it comes to winter hairstyles. With holiday parties, family gatherings and other events just around the corner, you need to have a few hairstyles ready to go. Give these simple winter hairstyles a try for your next event, and never hesitate to contact us if you have any questions about how to create them or anything specific to your hair. Can You Use Too Much Dry Shampoo? Dry shampoo can be a life saver. Sometimes you simply don’t have much time to spend on your quality hair care routine, including washing your hair every couple days, and dry shampoo can get you through those times. However, with how convenient it is, many people could be relying on it too much and potentially causing more harm than good. The good news is if you’ve become too reliant on dry shampoo, there are simple solutions to help get your hair and scalp healthy again. You don’t have to give up your dry shampoo completely, but limiting the use is important. The purpose of dry shampoo is to absorb some of the extra oil on the hair that would normally be removed when washing with a sulfate free shampoo. However, dry shampoo isn’t necessarily the best product for a healthy scalp. The powder and ingredients in it can clog the pores in the scalp, which prevents it from breathing and can lead to hair and scalp issues. You may eventually experience some irritation as a result, as well as other visible issues like dandruff. There’s nothing wrong with using dry shampoo on an as-needed basis. Many people use it to get them through the day after a workout, or if their hair is looking a little greasy and they don’t feel like washing it that night. Using dry shampoo every day without brushing it out completely can be considered going a little overboard. The main thing to remember when using it is to avoid scalp contact as much as possible, since the root of the issues will come from there. The best way to incorporate dry shampoo is to use it periodically in between washing days with your sulfate free shampoo. Sometimes you may want your hair to be a few days removed from getting washed so it will hold its style better. Dry shampoo is a valuable component to getting you through an extra day without washing, while still making your hair look great. Since everyone’s hair is different, you’ll have to pay close attention to yours and see how your other hair products for Remy hair look in combination with the dry shampoo and adjust your products or schedule accordingly. RemySoft is a firm believer that no two people will have the same quality hair care schedule. When used properly, dry shampoo is very valuable, but shouldn’t be relied on. 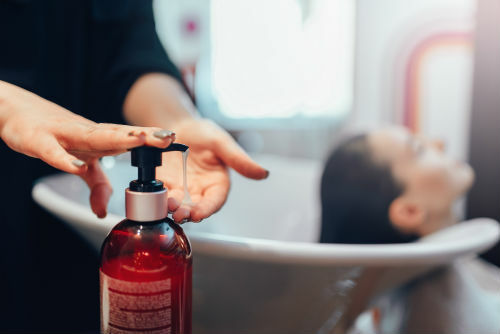 Nothing can provide the same benefits as a good hair wash with a great sulfate free shampoo, but life sometimes gets in the way of your regular washing schedule. We are here to help you with all things pertaining to your hair, so feel free to contact us at any time if you have any questions or concerns about yours. You may have heard of the benefits of using a sulfate free shampoo, but what makes sulfates so bad? Sulfates are designed to wash away all the dirt and oils in your hair to make it clean. However, sulfates also go a little too far and can actually strip away too many oils, which can lead to brittle, damaged or dry hair. Plus, if you color your hair, sulfates could make the colors fade much quicker. Here are some of the main reasons why using a sulfate free shampoo could benefit you the most. The stylist who colored your hair will likely recommend a particular shampoo to use to help maintain the vibrant color. If you look on the ingredient list, you likely won’t find any sulfates on it. This is because a sulfate free shampoo won’t leave your hair very dry, which is critical since the hair dye naturally dries out the hair a bit. And since a shampoo free of sulfates is gentler, you won’t run the risk of stripping out the hair color. One of the most basic explanations for people with dry hair is they don’t have enough moisture in it. This could be due to genetics, the environment or simply because you wash your hair too much and don’t give it enough of a chance to produce the right amount of oils. Finding a hydrating shampoo free of sulfates may slowly transform your dry, frizzy or damaged hair into a healthy and voluminous head of hair you can’t wait to style in the morning. It does just enough to keep the hair clean, while leaving behind the essential oils needed to maintain healthy hair. Some people have hair that simply doesn’t produce a significant amount of oil, so they don’t have a need to wash their hair every day. Using a sulfate free shampoo is a perfect complement, since it won’t strip away the little oil present in the hair. Many people find success by washing their hair every 2-3 days with a sulfate free shampoo, but you can experiment with it to see the frequency of washing your hair needs. RemySoft is a firm believer in always using the best sulfate free shampoo you can find. In many ways, it’s the foundation of any great hairstyle, since it makes the hair easier to work with and it always looks vibrant and healthy. If you have any questions at all about sulfates and what shampoo is right for your hair, never hesitate to contact us and we will be happy to give you our expert opinion. Winter is just around the corner, so there’s no better time than now to start thinking about what hair colors you’re going to sport. Whether it’s a color you’ve been eyeing for a few months and just waiting for the right opportunity, or if your favorite celebrity wore a color tone you fell in love with, now’s your chance to experiment with it. 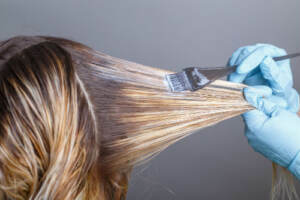 Just remember when you alter your hair color, you may need to also invest in some new hair products for Remy hair to protect the color and help it last as long as possible. Here are some popular hair colors you may consider this winter. If you’re already a brunette, going with a little darker brown color won’t be a drastic change, but it will still be noticeable. And if you don’t want to go completely darker, you can always just incorporate dark brown highlights to add some dimension. Combine these colors with a quality hair care routine and you’ll be set with your hair color for the winter months. Who said you can’t have sun-kissed hair in the winter? Blondes often miss how their hair looks during the summer, but the good news is adding some vibrant blonde highlights can create the summer effect. There’s no harm in going against the grain in this situation by going brighter with your hair color instead of the traditional darker colors for the winter. Honey lowlights can be incorporated with virtually any hair color. The honey color is a perfect mix of blonde and brown, so the change won’t seem drastic regardless of your current style. One thing to remember if you try honey lowlights is to get the best sulfate free shampoo you can find to protect the colors and prevent them from fading. People with red hair sometimes think their options are limited when it comes to being creative with their hair color. Copper undertones have become popular for redheads over the years, and it’s definitely a change worth trying this winter. It’s a subtle enough change where people will notice something different about your hair, but it won’t attract a significant amount of attention. If you have a lighter brown hair color, amber highlights may be a good trend to try. Similar to the honey lowlights, the amber highlights won’t completely transform your entire hair color, but just give it enough of a change to be noticeable. And again, using the best sulfate free shampoo will maintain the color of the highlights throughout the winter months and beyond. RemySoft is your resource for all hair products for Remy hair. But we also enjoy helping people find the perfect hairstyle and color. Finding the right hair color can be difficult, since most people don’t want the change to be too drastic. You will never know what looks best on you until you try, though, so give us a call if you need any advice about your hair.